Although I didn’t realize the characters in my novels drink a lot of tea, it really is not surprising, since I am a serious tea drinker. Always have been. When the Englishman entered my life, that particular habit found a cozy spot and settled in for good. We always drink tea first thing in the morning, and when together mid-afternoon will often indulge another. It’s easy and comforting and reviving. If you, like the reader above, are overwhelmed when it comes to shopping for and preparing a good cup of tea, I am sharing the advice I sent in reply. Perhaps you’ll find it handy. To replace coffee, the main thing to remember is that you want black tea. Not green or anything else. And most coffee drinkers prefer to start with something not flavored, so go with straight black tea. My #1 favorite breakfast tea is PG Tips, but you have to get the kind that is imported from England (the “English” tea sold in the US is made with different parts of the tea leaves and is not as flavorful). Unless you’re just insanely in love with tea, that’s a bit expensive. Because Christopher Robin is British and must begin his day with a classic cup (two sugars and milk), we have his mother send boxes of it. I also buy it at the English store (most towns have one). Again, pretty expensive, but fun to try maybe. To get started in the US, I’d suggest trying Twining’s English and Irish breakfast teas. The trick is to get the water boiling and pour it over the teabag as soon as it stops boiling, then let it steep for a full five minutes. The color is good after 1 minute, but the flavor is not really developed until five minutes. Also important: don’t put cream in tea, only milk. Add sugar as desired. Those are the best black teas. Constant Comment, by Bigelow, the classic orange flavored tea. Also try their Lemon Lift and Mint teas. If you ever see Twining’s Blackberry tea for sale, grab it. It’s one of the seasonal releases, and it’s absolutely delicious. Celestial Seasonings have many different kinds. Peppermint is nice after dinner. I like Sleepytime when I’m having trouble sleeping. Mandarin Orange Spice is nice, too. You might choose a box of mixed flavors and see what you like. One of the best teas in the world to me is Good Earth caffeine-free blend. It’s strong and sweet without sugar, and has no caffeine, so I can drink it all morning while I’m writing. It smells wonderful, too! Now I’m off to put the kettle on. There’s a rain storm bearing down over the mountains and a nice cup of tea sounds like just the thing. Do you have other favorite teas to recommend? I know there are readers here who, like me, have to have the English blend. Raise your hands and be counted. Thanks, Sharyn. I just noticed that yesterday on the O’Neal page. It should be fixed now. Ahhh, tea. Something I tend to go on and on about once I get started, but I’ll try to restrain myself. I agree that if one is looking to replace coffee in the morning, a good strong, black tea is the way to start. And a British import is the best way to go. My absolute favorite is Jackson’s of Piccadilly Darjeeling. I became addicted when I lived in Wales. Nearly impossible to get in the US. There are various online sources, but they seem to always be out of stock. (*sigh* A moment of silence for my lack of JoP-D.) But, yes, PG Tips is very good and I also like Typhoo and both are very affordable and easy to find in the US. If you have a World Market close, they are almost always in stock there. In the afternoons, I often have flavored teas. Some that are easy to get in the US that I like are Earl Grey and Lady Grey. Still good black tea flavor, plus a little something extra. Of the brands available in most US stores, Twinings and Bigelow are both good. I also like Chai and my go-to brand for that is Stash. Being a Heathen American, I also like iced tea, but I prefer to brew it. The sun tea just doesn’t have as much flavor. For that, I usually use 1/2 Lipton’s (or another US orange pekoe) and 1/2 something else. Favorites for the “something else” are green tea, Earl Grey, chai or Stash Lemon-Ginger. All waxing about tea is not only allowed here, but encouraged. I’m also an iced tea fan, Tara, and drink a lot of it in the summertime. I do love the Good Earth tea over ice. I second your comment on both English and Irish Breakfast tea from Twinings. I love the mossy, dark tones in the Irish and the English is great when I want a bright, clear taste. I also love Constant Comment, but find I gravitate more to the others as I get older. PG tips is how I start out my day as well. I didn’t know about the difference when bought or directly imported from England. Hmmmm. Will have to look into that. Other Celestial Seasonings teas that are good are the Bengal Spice and the Tummy Mint which has chamomile and a bit of fennel in it too. I think of it as Yummy Mint. Another fun thing to do is to pick fresh mint and pour boiling water over it. Not as strong as dried but lovely nonetheless. 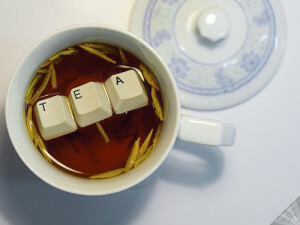 Mmm, tea, one of my favorite things. If you can, try Bewley’s Irish Breakfast. It is a wonder–especially with roasted cinnamon sprinkled over the top and a little milk. Gina, I’ll have to try the mint. I have some growing in my garden. Oh, my. Basil! I have NOT tried that, but must do so. I have a lot of basil in my garden right now. Asma, love the post. Definitely will try the cardamom pod with milk, too. It sounds as if it would have just enough zing to make it special. I am so glad to read these posts about tea! Especially since reading “The Secret to Everything”, and how Tessa was always drinking hot, milky tea, I have wanted to try drinking some different types. I am not a big coffee or tea drinker, unless it is cold outside. So this winter, these will be something to look forward to! Also, can you reccomend anything like the tea Tessa found in the commune that reminds her of her childhood?